EdbMails is the most appropriate Exchange recovery solution to repair corrupt EDB file database and convert EDB to PST file with all Mails, Calendar, Attachments, Contacts and Drafts etc. Also, it recovers corrupt, damaged or inaccessible Exchange Server database EDB files and resolves most of the Exchange Server errors like \'Dirty Shutdown\' etc. There is no Outlook dependency required for EdbMails to repair and export / save e-mails into Outlook PST file. Also, EdbMails is compatible under most of the Windows Operating System (Windows Client as well as Server Operating system) including 32-bit and 64-bit. EDB to PST Converter repairs corrupt or damaged Exchange EDB files and restores the mailboxes into Outlook PST file. You can easily view Mailbox data from the PST files using MS Outlook application. It supports MS Exchange Server Recovery for 2003, 2007, 2010 and 2013 corrupt and unmounted database. EDB to PST free tool helps you to recover mails, images, attachments, drafts, calendar, journals, appointments, tasks, notes, etc. from the damaged EDB files. 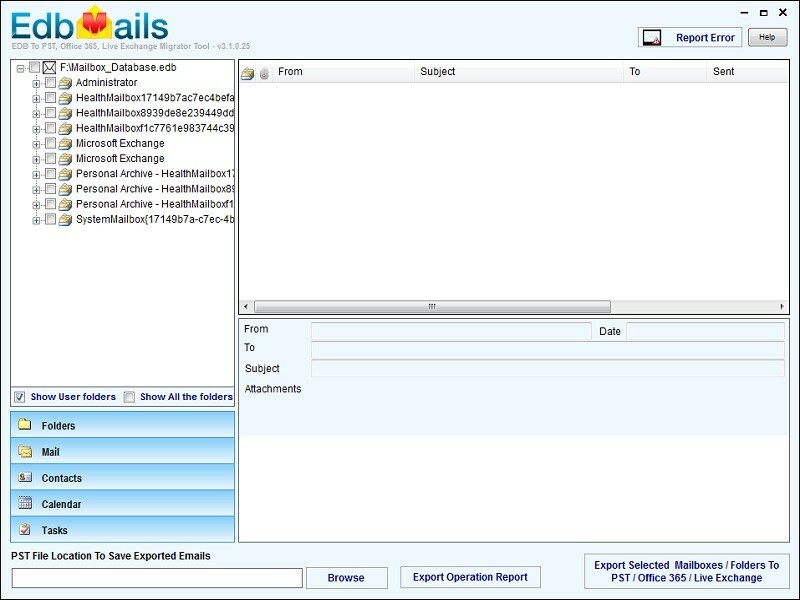 Its ease of use GUI will enables you to preview recovered mail items. EdbMails capability of granular / brick-level mailbox EDB to PST conversion support, will help you to recovery any desired Mailboxes data. If the Outlook PST file reaches size limit then, EDB to PST Converter will automatically split the PST file into multiple files based on the size limitation of the Outlook PST. Edb to PST Freeware converter can easily recover mailboxes, which have been deleted knowingly or unknowingly. In addition to saving the recovered data as PST file, it also allows you to save the recovered data as MSG, EML formats.